These days, it seems just about everyone is espousing the benefits of meditation (thank goodness). It’s an ancient practice sweeping the modern world, almost to the point of hysteria — and for good reason. The proven health benefits are off the charts. Psychology Today describes meditation as ‘the practice of turning your attention to a single point of reference. It can involve focusing on the breath, on bodily sensations, or on a word or phrase known as a mantra. In other words, meditation means turning your attention away from distracting thoughts and focusing on the present moment'. Sounds easy enough, but meditation confuses and confounds a lot of people — mostly along the lines of, Am I doing it right? Is this IT? Why can’t I quieten my mind? The digital and print worlds are awash with the ‘how to’ of meditation, and the details vary depending on form (there are reportedly about 23 different forms of meditation, and mindfulness is one of them), so it’s easy to get lost, frustrated, and give up. In fact, giving up on meditation is so common, many articles about the topic focus on debunking meditation myths and encouraging novices to stick with it despite the setbacks. 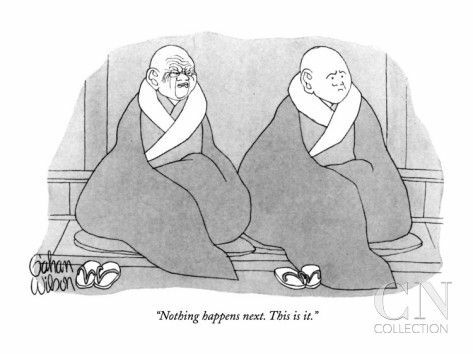 But, as this cartoon from The New Yorker shows, meditation really is simple once you cut through the confusion and expectations surrounding it. And the 'tricks' really boil down to these: Start, Focus, Start Over. Repeat, every day. There’s not much better than social proof of a concept you’re considering, and this video is almost the ultimate social proof. It features some of the most well-known and successful people in the world explaining the reasons why meditation is a non-negotiable for them. It will leave you thinking, ‘Well, who am I to doubt Katy Perry or Ellen?’ — or words to that effect. Following an on-air panic attack, US news anchor Dan Harris found meditation improved his anxiety so much that he’s become what he describes as an unintentional ‘public evangelist for meditation.' His web site, 10%Happier, provides a wealth of great meditation resources, including a curation of the latest quality content from around the web, and Dan’s own book, podcast and app. Dan also has a lot of useful videos on YouTube, which simplify and demystify meditation. This one, in combination with meditation expert Sharon Salzberg, takes beginners through a simple meditation process. Another video myth-busts the top three misconceptions around meditation, particularly driving home the fundamental point that meditation is all about STARTING OVER when the mind wanders (which is like a ‘bicep curl for the brain’). Dan’s straight-talking and clever animations make his work a must-see for meditation beginners. This is my personal favourite and the one that finally helped me meditate in a way that feels effective for me. Marie Forleo is an influencer of grand proportions, and so when she shares her personal meditation practice, people listen. Marie describes in a 9-minute nutshell what massive tomes on meditation might achieve in hundreds of pages. Get into it for a fast, fresh and effective take on going within and stilling the mind. Meditation is such a hot and important health topic, The New York Times dedicates an entire mini site to it. Their Well Guides to practising meditation and mindfulness in everyday life (such as while washing the dishes, filing taxes, or being disturbed by a barking dog) are simple, practical and insightful. 5. The wealth of meditation apps out there to make meditation easier and more accessible. Carolyn from Champagne Cartel recently listed the top 7, including her personal favourites. And here is a recommendation of 5 more from mindful.org. 6. And if you’re wondering how to fit meditation into your already fat schedule, head over to Tom Cronin at The Stillness Project to learn about his 70/20 method of meditation time management. I wrote about it here. And before you go, here are all the links to Sarah Wilson's writings on meditation, anxiety and beyond. 7. And one final thing: Sonesence does seriously good meditation music.